John Smith is a man who prefers actions with tangible results rather than promises and words. As a holder of a Master’s degree in Business Administration, John upholds the basic tenets of project development in order to produce tangible results based on planning realistic goals and action plans. Regardless of the tasks, John ensures that excellent results are produced. Beyond just producing results, John also debriefs his team to check and see the process conducted and finds out specific actions that could be improved in order to streamline the process to process a more efficient strategy moving forward. John began his professional career as a project leader of a world-class advertising firm focusing on corporations and large enterprises. With his credentials and his work ethic, John didn’t find it hard to rise among the ranks and became senior project manager within a year of employment. He then started to replicate his applied process among his peers, and his managers took note of how valuable he is for the firm. He also got the attention of other companies wanting to acquire him and gave him a couple of offers, of which he refused because of the potential he sees for growth in his firm. He was correct, and the loyalty and hard work he showed bore fruit and he got another promotion within 8 months after becoming a senior project leader. He was ready for the big league. The example of biography writing above shows the expertise and hard work exerted by our writers to show the best of our clients, without the need of being fictional. The biography writing sample showed that a person’s career, no matter how mundane it could be, can be made appealing and read-worthy for anyone. John story may not be the same as yours, but this biographical style could be yours if you want. 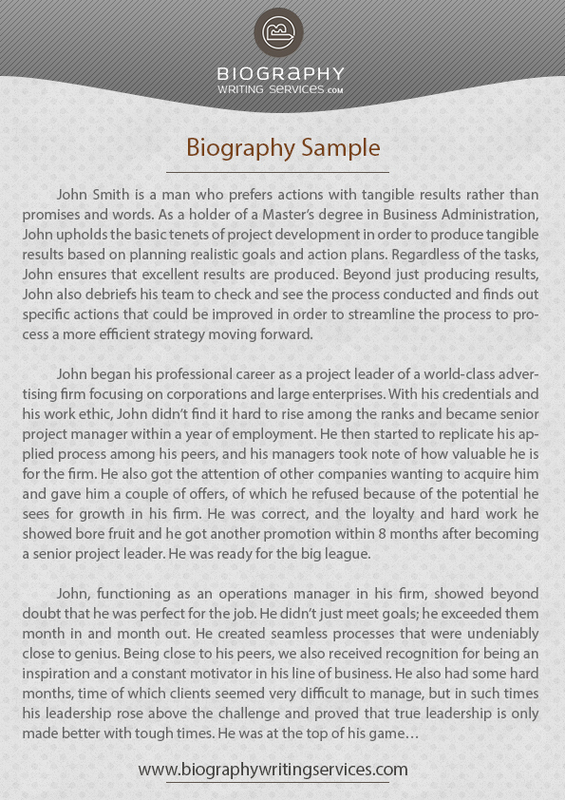 In order to streamline our bio-making process, we use the writing a biography template, considering the style applied. The difference is in the way it is adjusted to cater your needs. 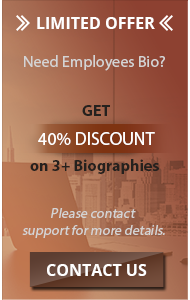 Our personal professional bio examples are only used as guides by our professional biography writers to make your biographies appealing to your clients, it is proved information, based on our experience. Sign-up now and enjoy our hassle-free process and justified rates, make fuel your success with your own biography. impress your readers, just call us!